As part of what will be an ongoing series of articles concerning significant people in the world of magic, we will kick off the series with a profile of a truly remarkable individual. We stayed close to home for this inaugural piece, for the subject is someone who occasionally takes up residence and works right here in the offices of the Conjuring Arts Research Center. When the performer steps out from behind the curtain, the first thing they notice about him is that he is very short, about four-feet-six inches, and yet very imposing. He has dark, curly, hair, a beard, strong features, and an elegant bespoke tailored suit. And as they assessed the diminutive performer, a realization explodes in their brains, when they notice that he has no hands; then they remember the host’s comments, and the introduction start to make sense. Their minds start to race and they can’t help but wonder what Mahdi is going to share with them. This is the Magic Castle, where many of the greatest sleight of hand experts of the last fifty years have performed. There’s a palpable mixture of excitement, curiosity, skepticism, even apprehension in the room. As they are asking themselves, What are we in for? he removes a deck of cards, spreads them out, and has one selected. The selected card, the Three of Hearts is shown around, and returned to the deck, Mahdi shuffles the cards, completely losing the selection. The deck is then tossed into the lap of spectator who selected the card, and he is instructed to find it. When we look back at Mahdi, he is holding the Three of Hearts. It’s as if the card appeared in his grip. It’s a truly magical moment. 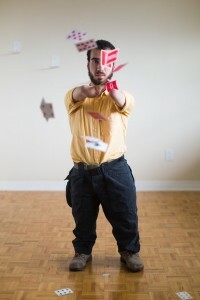 Mahdi then does a seldom-seen trick that is well over 100 years old, and involves several spectators, and he finishes with a modern classic—“Oil and Water” in which red and black card are repeatedly intermixed, and yet instantly separate. By the end of the twenty-minute show you are starting to think that the host was right, maybe nothing is impossible. Who is this artist, Mahdi, where did he come from, and how is he able to do what he does? 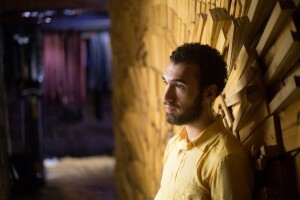 Despite looking more mature than he is, Mahdi is only twenty-five years old, and from Toronto. 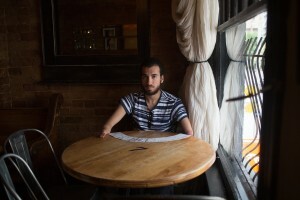 A middle child of four siblings, he was born without hands. His left arm stops at about the elbow, and he has an articulated appendage on his right arm, but no fingers. When he was young, he also struggled with a language disorder and was “always nervous about messing up my words.” He was not only shy, but very quiet. Despite the confidence of his answer, even he wasn’t sure it was possible. He started to watch David Blaine do magic on TV and the Internet. He found it amazing, but also depressing because he thought he could never do the kinds of things Blaine was doing. Then one day he stumbled upon a video of Derren Brown, a British mentalist. Mahdi says, “He was doing things by using the mind, talking to people, using memory, psychology, hypnosis, and other techniques. I thought, Oh, wow. I can do something like that.” On Brown’s website there was a list of books about memory, neurolinguistic programming, and psychology. Mahdi, hoping he could somehow create magic effects with these same techniques, went to the library and read the books on Brown’s list, unaware that most of what Brown does are standard conjuring tricks, dressed up as psychology, hypnosis, and suggestion. The first thing he focused on was developing his memory. He practiced memorizing the license plate numbers of cars as he walked to school. He got very good at it, and wondered how he could turn it into a magic trick. Then he got an idea. At the time it was rare for kids to have cell phones. Only a few kids had them, and he knew who did. He’d wait until one of these kids left school; after a couple minutes as they were walking down the street, Mahdi would say to a friend, “Pull out your phone, I wanna show you something interesting. Can you call, oh I don’t know. Call this person.” They would be put on speaker and he’d say, “Don’t tell me where you are, but just stop wherever you are. I don’t know if you’re in a classroom, or the bathroom, or outside. But look around, what’s the biggest object near you that you can touch?” He knew the only answer would be a car. Mahdi would ask them to touch the object, and he would slowly reveal that it was a car. By asking certain questions, he would determine which car it was, and he would tell them specific details about it that he had memorized that morning, culminating in the grand finale, revealing the license plate number. It caused a sensation. Nobody had a clue how he was doing it. It was transformative for him. He’d been very withdrawn his entire life, and this was the first time he was really interacting with people, overcoming his lifelong shyness. He found other ways to amaze his fellow students with apparent mind reading. He spent a fair amount of time in detention, but was always nice to the secretary, so she would let him use the computer. One day when fooling around on the computer he found a list of all the people in the school system, including their phone numbers and addresses. He made a copy for myself, and at appropriate moments could tell people information he shouldn’t know, like their father’s name, or where they lived. He became known as “Mahdi the magician”. But when he was sixteen he decided to steer away from the mental-based magic, and learn conjuring that was more “physical”. He bought a deck of cards and a book on card manipulation, The Expert at the Card Table. He didn’t tell anyone what he was doing. He didn’t want anyone to think, “Oh, here’s this kid trying to do magic and he can’t even hold the cards.” And at first, it was true, he couldn’t hold the deck. So he would stay up all night in the dark after everyone was asleep and would try to learn how to shuffle the deck. He says, “Maybe I’m romanticizing it, but I remember that time very fondly, staying up literally all night in the dark, trying to figure stuff out. When I started I had no idea what I was doing. I was experimenting and figuring things out through trial and error. There was a slow evolution. I couldn’t even cut a deck of cards without spilling the deck on the floor. Coming up with a procedure so people could select a card, and having it returned, shuffling, it was very slow.” He eventually realized that if he sat down, he could put the deck in his lap, braced against his stomach. Then by gripping the deck between his arms, he could cut and shuffle the deck, and eventually manipulate them in more complex ways. He started going to a magic shop in Toronto called the Browsers Den, where he would buy books on card magic. However, he didn’t socialize with magicians and the guys behind the counter didn’t know that he actually did magic. In October of 2009, he attended a meeting of magicians specifically interested in card magic, gambling, and card cheating. Mahdi sat shuffling a deck of cards, and a young magician named Shane Cobalt said, “Wow. Do that again.” Mahdi repeated the shuffle, then revealed that while he was shuffling, he was also controlling a particular card to a specific position in the deck. Shane was blown away, and had been completely fooled by Mahdi’s technique. He started hanging out with a few magicians. Mahdi has attended many conferences and conventions since that first Magic-Con. But there is one downside to it all. He says, “I’ve made so many friends. The problem is, you make too many friends, you want to see them all the time, and they live all over the world.” One of those friends is Ricky Jay, and Mahdi was able to spend some time with Jay while in Los Angeles, performing at the Castle. The two first met a few years ago in New York, when Kalush brought them together. In addition to a deep love of card magic, they bonded over a mutual interest in the life and work of Matthew Buchinger. Also known as “the little man from Nuremburg”, Buchinger was an eighteenth century German artist, magician, musician, and calligrapher, who was born without hands or legs. He had tremendous dexterity, in spite of his disability, and was famous throughout Europe. Jay relates, “We talked quite a bit about the Cups and Balls and what Buchinger did with that. Mahdi really did have some fascinating observations about him. There is a print of Buchinger where he is pictured doing coin tricks, and that really had us intrigued. But I’ve never seen a description of what the performance was like. Our notions about his magic is speculative. It’s very hard to tell what he actually did. I’ve speculated about if for a lot of years, and Mahdi has a really different insight. I feel that we’re just at the beginning of understanding. We’ve shared a couple of nice e-mails going back and forth.” Recently, Jay published a book about Buchinger, and Mahdi’s insights were an important part of the research. Toward that end, last year, when Mahdi and Shane, his friend from the magic meeting, got booked to do a magic convention in Finland, an idea was hatched for them to do a formal show together. Christian Engblom, a Finnish magician, put them in touch with the right people to book a theatre, etc. They did two shows for the public, they got publicity (Mahdi appeared on Finnish MTV), and people came out. The show is called Modern Magic. An Evening of Bespoke Conjuring, and they plan to do a run of the show in Toronto later this year.